Through hard work and distinct vision, a network of local trail builders are carving out the future of mountain biking in Cumberland. Around 11am on a sunny Monday, Dan Espeseth, Sean Manara, and Chris Hancock show up for work. Instead of riding to their usual job at Dodge City Cycles (DCC), they drive the logging roads above Cumberland to the end of spur, park their trucks, load up their tools, walk into the clear cut, and start shoveling. 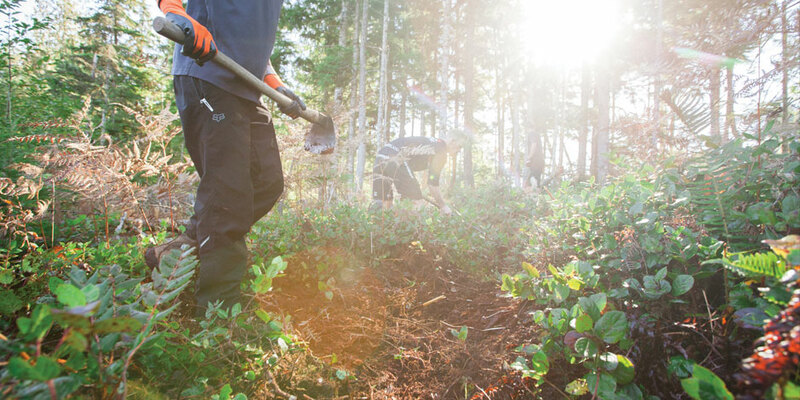 Within a few minutes the mountainside echoes with the sound of picks on rock, tools hacking out salal, and soil spilling in and out of buckets. Red dust floats in the air. Guys grunt. Beads appear on brows. I’m trying to keep up, but I don’t really know what I’m doing. I’m already caked in dust. I can feel a blister forming. My arms ache and a rock is rattling around in my bike shoe. I’ve always felt guilty about not contributing to the trail network I’ve been riding for 17 years. But I’m here for an interview, and it’s not the one I expected when I walked into DCC the week before. In short, it was not the place to introduce someone to the sport. But things have obviously changed. Many consider Cumberland’s trail network modern and world class. While it’s still short on easy trails, beginner group rides have no trouble finding approachable stuff to ride every week. It’s a long way between the past and the present, and Dan Espeseth is one of the people bridging that history. He began building trail in the late 90s, opened DCC in 2002, and has continued with both ever since. When I walked into the bike shop hoping to interview him he wasn’t there, and when I told Hancock about the article I was working on he had a better idea. “We’re building a new trail right next to Dodge Balls,” he told me. “Old next to new. You should come and check it out.” So here I am, cluelessly hacking at the ground, while interviewing Espeseth. Dodge Balls was the Cumberland test piece, until it was logged around 2005 and forgotten. “Flow took over and we all sold our downhill bikes.” Today a few of the jumps still stand in the clear cut not far from the new trail. Among all the logging slash, fraying ropes somehow hold the rotting ramps like launch pads to nowhere. In comparison, the new trail’s jumps look safe and sustainable. Natural features like stumps, drops, or gullies serve as take offs. Silky berms link them together. It looks fast and it flows, but is a step up in difficulty compared to most of the recent trail builds in the area. “Cumberland has become so gentrified,” Espeseth explains. “We want to build something we want to ride. 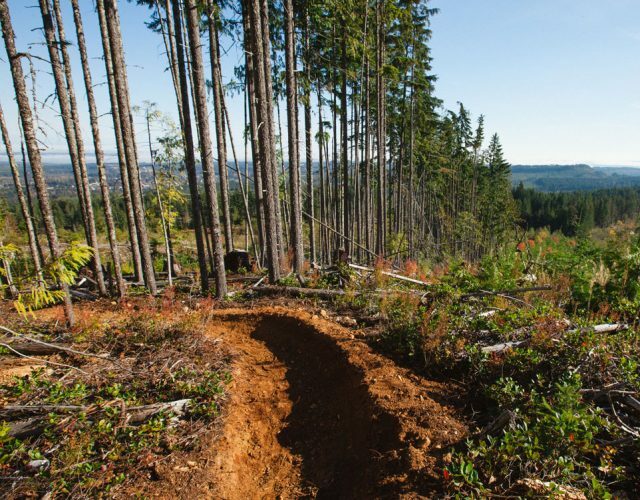 Something a little harder with more consequence, but still sustainable.” This is the buzzword in trail building these days. The new style is about doing more with less gradient, ditching straight down for switchbacks, and trading built-up wooden features for rock rolls and berms. The trails are safer and easier to maintain… if a little boring to guys who learned pain tolerance on the likes of Dodge Balls. At the same time, bike technology advanced. Instead of needing a downhill as well as a cross country bike, all mountain steeds were light enough to climb well, and tough enough to jump. Which came first, the trail or the bike? This is an endless debate. Regardless, flow was born. Tea Pot and Soggy Biscuit were some of the first of these new trails in Cumberland. Now most of the trail network has the feel of flow. A couple hours into building, I’m finally getting the hang of it and we’re picking up steam towards the trail’s end near the Sykes Bridge junction. They’re going to call the trail Sphagnum PI. As I pack up for the day, I feel a small hint of satisfaction that I’m helping advance the trail network. Sphagnum is different than anything else that exists in Cumberland. It’s another step in trail evolution; the culmination of more than 20 years of people like Dan Espeseth, Sean Manara, and Chris Hancock going into the woods and building what they want to ride. And as a result, they’re helping to define what the town of Cumberland is to both locals and tourists, from the outside in.